Most of the cities and towns in Punjab are well-connected by an extensive road network which helps farmers to transport their agriculture produce to urban centres in double quick time. Public transport is provided by buses, auto rickshaws, Indian railways and an international rail connection to Pakistan (Samjhauta Express). The state has a large network of multimodal transportation system which contributed much to the wealth generation in rural Punjab. Punjab is well connected to its four neighbouring states and the rest of India through 15 national highways (NH) which are 1, 1A, 10, 15, 20, 21, 22, 64, 70, 71, 72, 95, 103A New, 503 Extension New, 703 New 703A New and 754 New. All the cities and towns of Punjab are connected by four-lane national highways. 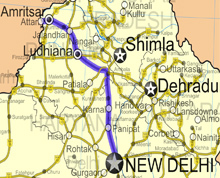 The Grand Trunk Road, also known as NH1 connects Kolkata to Peshawar passing through Jalandhar and Amritsar. Another major national highway connects Punjab to Jammu passing through Hoshiarpur and Pathankot. National highways passing through the state are ranked the best in the country with widespread road networks that serve isolated towns as well as the border region. Ludhiana and Amritsar cities among several Indian cities have highest accident rate in India. There are also the bus rapid transit systems like Amritsar BRTS and Ludhiana BRTS in cities of Amritsar and Ludhiana respectively. In the 2015-16 budget, the state government proposed to invest $334.77 million for the development of road infrastructure in Punjab. Along with this investment, an amount of $497.67 million has been proposed by the government for the improvement of national highways. The railways play a critical role in the state, connecting major industrial units in the oil refining, cement, fertiliser, thermal power and manufacturing sectors to suppliers and markets. Punjab's railway network spans about 2,100 km. It falls under the jurisdiction of Northern Railways that spreads acrossPunjab, Jammu and Kashmir, Haryana, Himachal Pradesh, Uttarakhand, Uttar Pradesh, Delhi and Chandigarh. The main inter-state railway routes are Amritsar-Ambala-Delhi, Sri Ganganagar-Ambala-Delhi, Ferozpur-Ludhiana-Ambala, Pathankot-Roopnagar-Fatehgarh Sahib and Sri Ganganagar-Bhatinda-Narwana. In March 2015, the state government announced plans to establish a joint venture with Indian Railways. The purpose behind this joint venture is to enhance the planned rail projects in the state as well as to take up new projects, including setting up of ultra-modern railway stations and laying new railway tracks. Amritsar is the largest railway station having trains connecting to all major cities. The Shatabdi Express connects Amritsar to Delhi. The railway junction in Bhatinda is the largest in Asia. Ludhiana Metro is a proposed rapid transit system for the metropolitan city of Ludhiana. Punjab has five civil airports. The Sri Guru Ram Dass Jee International Airport in Amritsar is the largest and most important airport in the state and is also the second busiest in North India after Delhi Airport. Other airports in Punjab are in Bathinda, Pathankot, Patiala, Sahnewal and Chandigarh. The aircraft movement from Chandigarh airport has increased from 9,690 in 2013-14 to 10,968 in 2014-15. 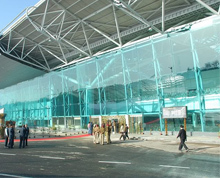 Passenger traffic from Chandigarh airport has increased from 1,049,397 in 2013-14 to 1,206,292 in 2014-15. The cargo handled from Chandigarh airport has increased from 3,315 tonnes in 2013-14 to 5,065 tonnes in 2014-15. As of June 2015, Punjab had total installed power generation capacity of 10,580.39 MW. It consisted of 5,013.43 MW under state utilities, 2,047.74 MW under central utilities and 3,519.62 MW under the private sector. Of the total installed capacity, 6,733.8 MW was contributed by thermal power, 3,145.13 MW by hydropower, 493.42 MW by renewable power and nuclear power contributed 208.04 MW to the total capacity. The Punjab Energy Development Agency (PEDA) is the nodal organisation for renewable energy development in the state. The state government has announced plans to install two thermal power plants with 660 MW capacity each in the state. Both plants are expected to be operational by the end of 2015. Punjab had achieved 100% village electrification as of March 2014. The state government is continuously focusing on the usage of renewable sources of energy. As of March 2013, about 387.58 MW was contributed by renewable energy which increased to 493.42 MW as of June 2015. Under New and Renewable Sources of Energy (NRSE) Policy, 2012 of the state, the government is planning to increase the contribution of renewable energy to2,400 MW by 2022. In the 2015-16 budget, the state government has proposed to invest $909.75 million for the improvement of power infrastructure in the state. Out of the overall allocated budget for power infrastructure, $159.25 million has been sanctioned for power transmission, whereas $172.52 million is for power generation and $290.31 million has been sanctioned for power distribution. According to the Telecom Regulatory Authority of India (TRAI), Punjab telecom circle had 30.60 million wireless subscribers and 1.130 million wire-line subscribers as of May 2015. The tele-density in the state was 104.72%, significantly higher than the national average of 78.73% as of February 2015. As of May 2015, the state had 1,490 telephone exchanges. The state had 3,855 post offices as of May 2015.